Why touch a screen when you can touch yourself? 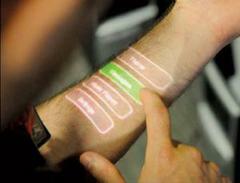 Er, that seems to be the message of SkinPut, a new technology that turns your forearm into a control panel for gadgets. It allows you to tap your arm to input commands into your phone instead of fiddling around with the keypad. Yes your arm is now the touchscreen. Skinput technology uses two pieces of technology to make this work – a projector and a microphone. The pica projector which can be built into mobile phones projects buttons on your skin; and then very sensitive microphones can ‘hear’ the sound you make when you tap your skin. Not only can they hear it, but the microphones can also analyse the sound and work out whereabouts in your arm you tapped. Depending on the density of bone and flesh in different parts of your arm, slightly different sounds are made when you tap it and Skinput is able to work out what. The catch is that you have to project these buttons onto a very particular place on your arm for this to work, which means you need to wear an armband to hold the phone. Alternatively you could just a get a few buttons tattooed into the correct places and do away with the projector but hold fire on that till we hear a bit more about whether this technology will actually take off or not. Once the armband has worked out which gesture you performed it sends a signal via Bluetooth to any of a number of nearby devices.